If you're looking for a large, attractive and brandable item, you can't go far wrong with a Promotional Golf Umbrella. 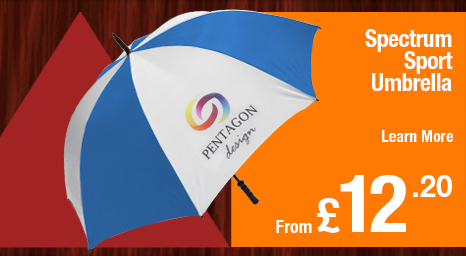 Offering a huge print area, with the reliability you can expect from Click Promo Gifts, our range of Golf Umbrellas, can suit any event and any budget. Considering the state of the British Climate recently, it might not be the worst idea to consider umbrellas for your next promotion, and with Pormotional Golf Umbrellas, you can ensure that none of your clients ever get a soaking again!